My maternal great grandmother, Raffaela Marisi Mansi, was sent to England when she was fourteen, after she had been raped by a Catholic priest in Rome and became pregnant to him. Anne Frandi-Coory’s great grandparents Aristodemo and Annunziata Fabbrucci Frandi. The name Aristodemo is taken from the Greek, ‘Aristodemos’. ***A fully updated and comprehensive family tree is available free of charge from author Anne Frandi-Coory. Please advise in comments section below if any family members have been omitted or if any details are incorrect. Aristodemo & Annunziata with their seven children (c. 1900). Sitting on rug at front: Alfredo, Anne Frandi-Coory’s maternal grandfather. 4-Roger Grego b. Watford (Adopted by Philomena’s sister, Barbara Grego Johnson). Note: Raffaela gave birth to 17 children in total. Reggie died in WW1, Florence died of TB, others died at birth or in childhood. My fascination with Italian surnames: Parts one and two. Hi there, I have been “working on” my wife’s family tree, she is the daughter of Harold Earnest SWAINSON who married Joyce FRANDI. Hello John. I am Joyce Frandi’s granddaughter and I would love a copy emailed to me if poss please. Thank you kindly. Kimberley Rarere. Roger Johnson son of Philomena (Emmie) Grego, is interested in tracing her, as we lost contact a few years ago. Her last know address was in Fridley, Minnesota USA. Her married name was Stacey. Did Emmmie have a brother named Alfonso Bouvenora Grego ? If so that was my grandfather and I know very little about his side of the family. I have been unable to trace Emmie to the States. I did interview her youngest brother Phillip, whom she was closest to, in 1994. That information is all in my book ‘Whatever Happened to Ishtar?’. The tragedy of Raffaela and her descendents, including my grandmother (Emmie’s older sister Maria) and my mother, makes harrowing reading. I would have liked to have met Roger, although I did hear a lot about him when I was in Watford in 1994. Sorry I can not be of any help to Roger. As you will see by some of my posts, defeated mothers are common on my Italian family tree, and tragedies abound. yes, he was known as Alfie Grego. He lived in Leavesden Road, Watford with his wife Ruby and son Stephen. Thank you for taking the time to inform me of the mistake in the Grego family tree. I have deleted the name ‘Julia’ from the family tree. The mistake is mine, and I apologise. Obviously, I have misunderstood who the woman was in some of the photos of the Grego family which I was given in1994. Well, I was searching for my grandmother’s family in the 1901 and 1911 censuses and happened to google Filippo Grego only to come up with this amazing result. My grandmother was Julia Grego (who died in 2001 in Ashford Middlesex at the age of 100). Her eldest son Doug (90) is in a nursing home in London and her other son Roy (87) is still active and healthy in the Bahamas (where he was posted in WW2), and where I was born in 1950. We never knew much about the Italian side of the family and were very confused about names. The 1911 census lists Filippo’s wife as Fellucia while the 1901 census lists it as Maria C. My father always knew his grandmother as Raphaella. Then there were the other names that appeared on various documents like Manzi, Pirelli, and Amendola. This site – and your book – should clear a lot of things up for me. The only other Grego I knew personally was Philip (who, the story goes, inherited all of the old man’s money much to the dismay of his siblings). He visited us in the Bahamas during the 1970s. I had been planning a trip to Amalfi, which is where my father always thought that Filippo and Raphaella came from. What does your research suggest? Sorry – I misspoke. It was Joey Grego who, the story goes, inherited all of the old man’s money much to the dismay of his siblings) and who visited us in the Bahamas during the 1970s. Yes, my father knew Philip. Is he still alive? Julia married Herbert Edwin Smith of Great Hockham, Norfolk in 1920 – after his return from WW1 (Palestine). 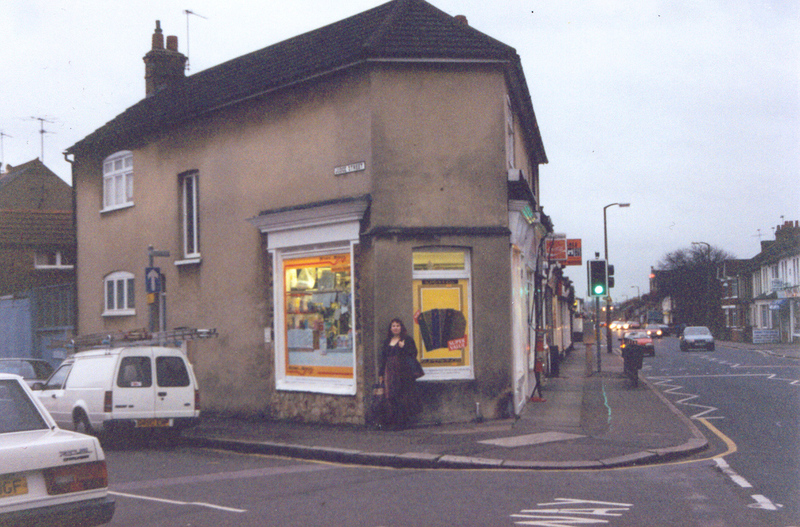 They lived in Watford for a time and Herbert (known as Minto) even worked for the old man briefly in the chip shop. They moved around a bit before settling in Ashford about 1939. Julia’s son Doug was posted to North Africa in the 8th Army during WW2 (no children) and Roy was posted to the Bahamas in the RAF, where he married a Bahamian (two children). My parents were acquainted with several of the Grego children in the old days (we lived in Surrey from 1955-60). Julia was born feb 25 1900 in watford and died june 18 2000 in Ashford (sorry for the earlier error – I just looked at the death certificate). She was always known as Julie. Phillip Grego died in 1998. I have sent you an email as well. 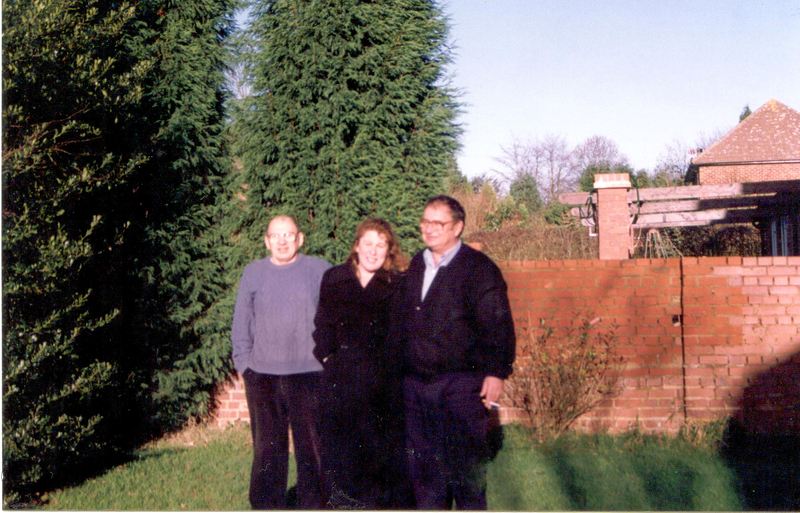 Just bought a copy of the book for my Dad, Michael Joseph Carillo (pictured with Peter Grego above in our back garden)! My father Michael Carillo’s Grandparents were Raphaela Mansi and Filippo Grego. Pictured with his cousin Peter Grego and you in our back garden @ Long Lane in 1994. I’ve just bought your book and will be reading it with dad, we are always keen to know more about our family tree. Its been interesting to read the blogs, much of which Dad knew, his memory is good. How lovely to hear from you. I am glad you have corrected my mistake in calling your father “Alfonso” instead of Michael. Not sure how that occurred, but I will amend my records. Hi, I am seeking information regarding Rosaria Grego Rea (born about 1850-1865) who married Constandino Rea. They would be my ggggrandparents. Do you know if Giuseppe Frandi had any sons who remained in Italy ? I have a great grandfather with that name, who came to the U.S. from Pisa circa 1905. Have you got a up-dated vision of our family tree. My grand father is Ian Buchanan Frandi and my Mum is the late Lois May Frandi d.6th Sept 1984. I found a mistake in the genealogy. The son of Riciotti Orlando FRANDI and Edna Ruth Cook Watts FRANDI is not Riciotti, but Richard Orlando FRANDI. I am the grand daughter of Richard Orlando Frandi. Thank you for pointing out my mistake in the family tree. Regards Anne. I am Farrah Moyden I would like to be able to speak with you. what you have written is my life, what an eye opener, we are related and it is amasing how it all follows down the line. I will contact you by private email, Farrah… I am so glad you found my blog. Hello Anne, I have been unable to get in contact with you via private email, hoping all is well. I have finished reading your book and am so glad I came across it. It has allowed me to understand much about many things. As a woman who has lived all her life wanting to find and connect with family, but not being able to do so because of peoples ideas and beliefs towards her mother,and herself I was well able to relate to your story.Thank you. I am glad you could relate to my story, Farah, and that it has helped you. Will try again to contact you by email. Anne. Hi Anne, for some reason I decided to google my maternal grandfather, Richard Orlando Frandi, and upon being directed to this website I have discovered that he must be your first cousin, thus making you my great aunty! 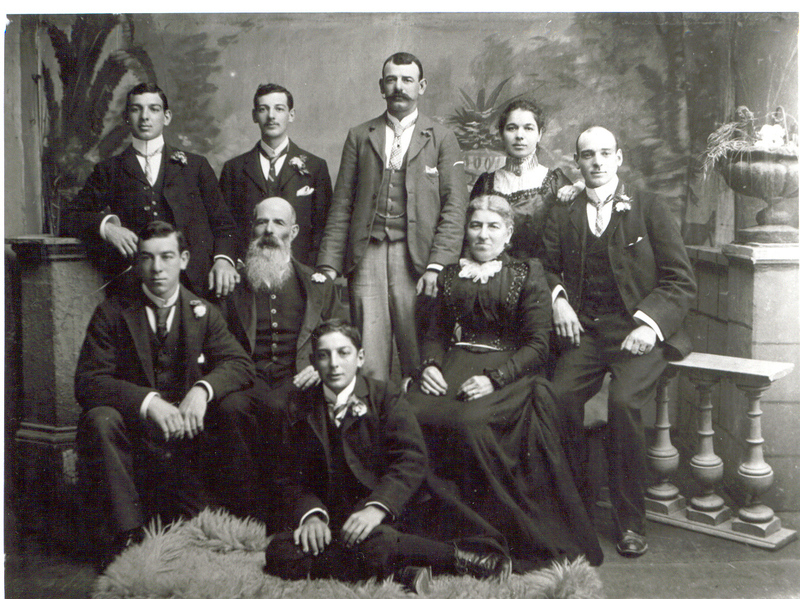 I was very suprised to see the Frandi family portrait from 1900, as my mother has had a framed copy of that exact portrait in her living room, with all their names recorded on the back of it, for as long as I can remember! I was wondering if you happened to have any other pictures? My grandfather died before I was born and I have never seen not one photograph of him. Also, if you want any information about descendants of his, I would be more than happy to assist you. Thank you for your consideration. Dear Tyler, thank you for your comments. It’s always good to hear from descendents of Aristodemo and Annunziata Frandi; a wonderful couple. Unfortunately I couldn’t find any photos of Richard, your grandfather, only one of his father. He is actually not my first cousin. He is descended from Aristodemo’s oldest son Francesco Frandi while I am descended from his youngest son, Alfredo Frandi. So, cousins yes but several times removed. I do hope you manage to find a photo of your grandad, it helps to feel more connected if you know what they look like. Good luck and kind regards, Anne. Hi there Christina. I do wish I could help you but I have never come across that variation of the Mansi name. I love reading these histories of families who travelled so much and scattered throughout the US, and now the effort made to reconnect among their descendants! I used to translate into Italian the correspondence for the Balbi family from Genoa, and I remember wondering about the lives of their ancestors. It is a very fascinating thing! They made a dedicated website, as well, and they even published some books about the Balbi family. Let me know if you need any help in contacting your Italian relatives! Thank you for your offer. My journey researching my family tree has been a very interesting one. Always a work in progress! Hello Anne. I’m researching my gg grandfather Joe Gestro who was an Italian born fisherman of Wellington and a contemporary of Aristodermo Frandi. Joe was the first president of the Fishermen’s Union in Wellington and the secretary of the union was listed as A. Frandi (junior) who I think may have been Aristodermo’s son Antonio but I’m not sure. I was hoping you may be able to help me identify which Frandi was the union secretary. Many thanks. I’m just beginning to look at this area of my ancestors life and I haven’t studied the Frandi family so please forgive me if I confuse any of my facts, I am more than happy to be corrected. I had thought there were two Frandi families in Wellington at the time because I have a reference to an F and A Frandi that professed to have “no connection whatsoever” with the other Frandis. I had first thought that the A Frandi connected to the union was Aristodemo himself being that he was a fisherman but I then found another reference to the union secretary being A Frandi (junior). I had originally discounted Ateo as being the A Frandi connected with the union as the good captain was a public figure and I would have assumed there would have been a reference to it. Looking at the dates on the family tree above though I see that Antonio would have been around 12 and Alfredo around 6 at the time I’m looking at (1890/91). I presume then that it must have been Ateo who was the union secretary. You certainly have two very distinguished ancestors in Aristodemo and Ateo Frandi. I had read a little on Aristodemo and would like to read more on his time with Garabaldi if there is anything available. There was a rumour that my gg grandfather may have been a Garabaldini but I’ve never found any reference to any connection. I had also read a little on Ateo after the memorial sign was unveiled. Thanks Anne. I spent some time last night reading through your blog and I think I shall certainly have to read your book. If I come across anything else relevant to the Frandi family I’ll let you know. I want to know if I’m related to this family. My name is Roslyn grego my father is antonio (Tony) Grego and his father Jimmy Grego who married Barbra crittle. My family too changed there name from Greco to Grego. Hello Roslyn…I haven’t come across those names in my research, but it doesn’t rule out us having shared ancestors. Many Greek families used the surname Greco which referred to families with Greek ancestry. My branch of the Grego family originated in a Greek settlement on the Amalfi Coast in Italy. Do you know where your family originated? Yeah Italy. My grandfather is James Grego and his father is antonio grego an mother is Elizabeth Grego (troy) . So far the only other maiden name i found is antonio Grego’s wife her last name was troy. 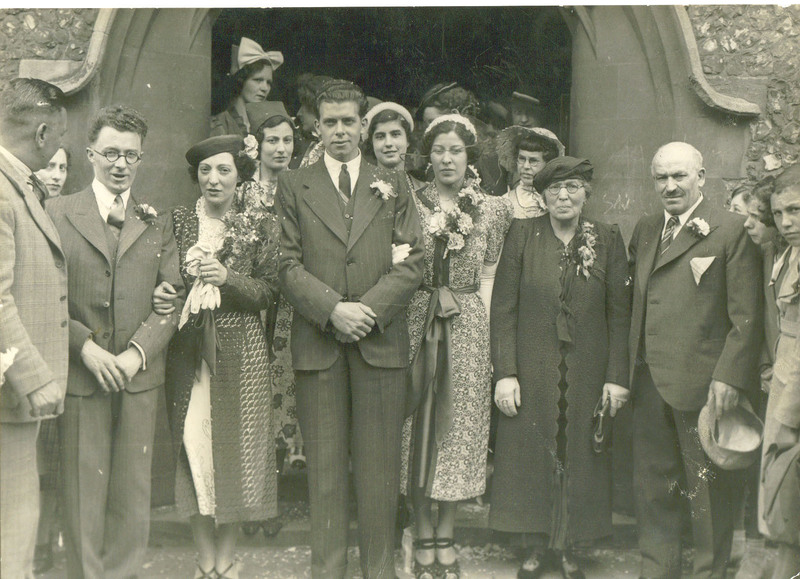 A Google search for ‘FRANDI’ produced numerous pages and some images one image in particular a wedding photo shows Katrina the bride with her parents and siblings I am assuming this would be her marriage to Mr Fraser? I do have a later image of Katrina (TBV) and was looking for permission to use the wedding image from google if possible on our family tree? Also if known and you are happy to share when the marriage occurred. Ancestry “Andrews/Foote Merged Tree May 2014” this is a private tree the website for the 2nd tree is included below. Hi there Brian, thanks for making contact and asking permission to use a photo from my blog. Of course you may. I have been given many photos by various Frandi family members so I am pleased to share, provided permission is sought. The photo you requested, plus others that may interest you, are posted on this blog: Go to the menu on the right of the page and scroll down to Our Ancestral Short Stories then scroll down to Reginald Alfred Frandi (Katrina’s father). As far as I know, Katrina only married once; sadly the groom isn’t in this photo. Such a tragedy that both of Reg Frandi’s daughters died so young. Kind regards, Anne. Hello Mikhail. We certainly could share Frandi ancestors…as you can see in the family tree above, there are two men with the middle name ‘Orlando’ and names do run in families. Certainly my great grandparents Annunziata and Aristodemo Frandi lived in Pisa after they married; Aristodemo was born in Pistoia and Annunziata was born in Peretola, Florence…so the Frandis do have a strong connection with Tuscany.